The “Cooling Sun” Crock is as reliable and perennial as the Grass, or whatever they’re smoking in Denierville these days. Readers here, of course, always get the right dope. Short take: The sun has cycles, they can affect climate on earth, but they are, in the big scheme of things, a rounding error compared to the big picture greenhouse warming. New study by Dan Lubin at Scripps is being hyped by the usual suspects, so here’s the press release from UC San Diego, just so you’ll have the original story. Dan appears in the video above, (I interviewed him during a similar blip in 2011) – so I think I’m clear on what he thinks about this topic. I’m shooting an email nevertheless to see if he wants to update us. Stay tuned. Die kalte Sonne: warum die Klimakatastrophe nicht stattfindet. Fritz Vahrenholt, Sebastian Lüning. 2012. 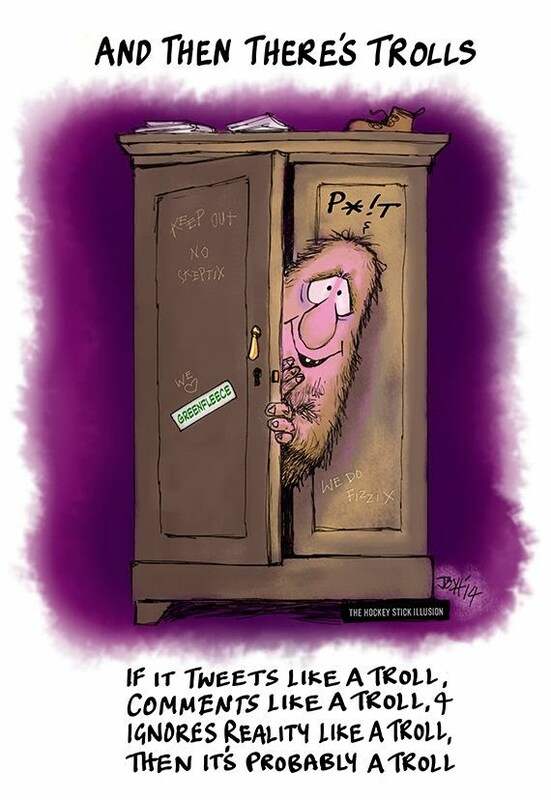 The cold alarmists reappear periodically. The aforementioned book is 6 years old now. I’m not sure there is a regular period to their appearances, it seems sort of random. Vahrenholt is a Ph.D. chemist, who served in government environmental posts before running a wind turbine company. And he drifted into climate denialism, apparently persuaded by stuff like solar cycles are the major factor. A climate change denier par excellence. It looked to me that it was waiting in the wings to take over as the main thrust when the inevitable very large El Nino happened and ended the GMST plots from 1998 (I realize it was also going before 2015). I’m not so sure the appearance of the “impending ice age” meme is random. It reappears at regular, although not exact intervals, timed to keep doubt in the minds of the general public. It’s an effective tactic. If the message was constant, the public would develop immunity. Much more effective to reintroduce the theme at the point where it was previously almost forgotten. I’m sure there is an element of deliberation in it’s reappearances. An old crock in new skins. => What would happen if the sun fell to Maunder Minimum levels? It’s important to note that each time the instrument was changed (well, 2 times I’ve seen) the newer instrument showed lower TSI than older and, not surprisingly, the scientist/engineer teams found the newer instrument more accurate so the TSI centred at ~1366.0 w/m**2 is now replaced by TSI centred at ~1362.0 w/m**2 (rough numbers, you can find the actual) because I recall a “denier” video that mixed’n’didnt’matched to falsely include the ~4.0 w/m**2 instrumental reduction as part of an actual TSI reduction. Your comment doesn’t make any sense in relation to the graph, grindupbaker. The graph is at the link. You’re juggling apples with oranges here, grindupbaker. What counts are the occurring TSI fluctuations. I’m not juggling any apples with any oranges anywhere. You suffer from dyslexia. Any chance the sun could cool so much it starts pulling heat out of the ocean (he said, sarcastically)? Because that’s what we need now or the first ten feet of sea level rise is a done deal. I live in Fraser Valley. I have a divergent theory that the Sun ceased existing 8 weeks ago. No one else just a little worried that we have the weakest solar cycle in a very long time and have just had the hottest non El Nino year ever. Solar cycle 25 looks to be a poor one too, but you know global temperatures are not going to go down. Solar cycle 25 starts about 2020 which would take us to 2031. Even if the cycle is a total non goer, temperatures then will be well above today’s. There is still so much we don’t know, but a super active cycle 25 is most unlikely. Overall very good. Without disputing the main thrust of your argument I wanted to add a short comment about how sunspot activity effects climate. My understanding is that cosmic rays induce cloud formation via instigating nucleation. Given the altitudes where this occurs, this results in net cooling. Coronal mass ejections in our direction from the sun strengthen the Earth’s magnetosphere which deflects cosmic rays around the earth rather than entering the atmosphere. In other words: more sunspots means less cosmic rays and therefore warmer climate. Fewer sunspots, such as the Maunder Minimum, leaves the magnetosphere alone, thereby allowing cosmic rays to strike the atmosphere and thereby create clouds and cooling. => What’s the link between cosmic rays and climate change? Also see my comment above concerning the Maunder Minimum. I did not say or imply that cosmic rays are responsible for the long term heating we are now experiencing. I just pointed out that the article did not mention a different mechanism than ultraviolet irradiance whereby the solar activity can effect climate. As pointed out in the video, the magnitude of the Maunder Minimum was relatively small compared to the heating affects occurring now. Since the sun has been relatively quiet lately with the last solar sunspot maximum being notably weak, to the extent that that the sun is influencing climate it has been increasing cooling cloud cover, thereby combatting the increase in CO2. 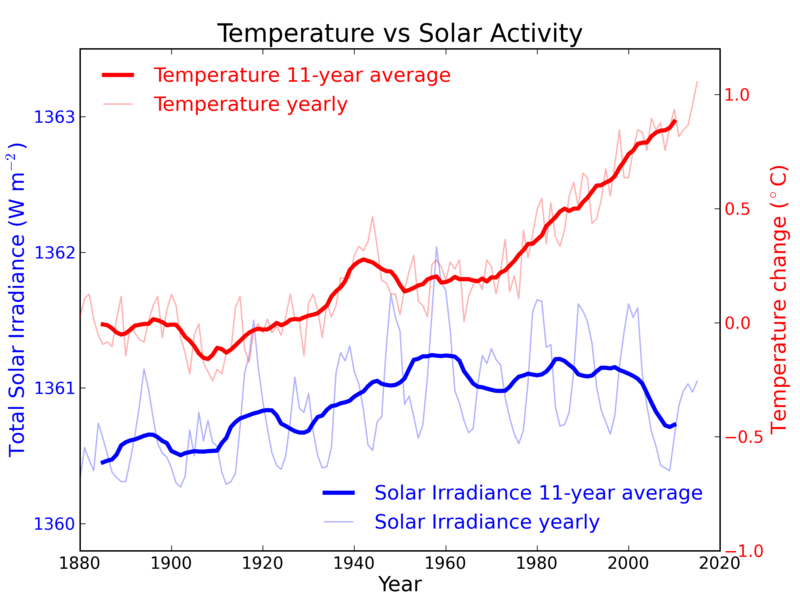 If the sun returned to more normal levels of activity climate warming will increase. sks asserts this “the second step is often glossed over by those espousing the GCR warming theory. Freshly nucleated particles must grow by approximately a factor of 100,000 in mass before they can effectively scatter solar radiation or be activated into a cloud droplet (Verheggen 2009). Pierce and Adams (2009) investigated this second step by using a a general circulation model with online aerosol microphysics in order to evaluate the growth rate of aerosols from changes in cosmic ray flux, and found that they are far too small to play a significant role in cloud formation or climate change”. I recall Dan Lubin mentioning that Forbush Events did not produce the postulated change in cloud cover (not measurable). James Hansen, Makiko Sato and Reto Ruedy 2014-01-21 say this about that: “Amplification of the direct solar forcing is conceivable, e.g., through effects on ozone or atmospheric condensation nuclei, but empirical data place a factor of two upper limit on the amplification, with the most likely forcing in the range 100-120% of the directly measured solar irradiance change”. Ref: 5 Hansen, J., M. Sato, P. Kharecha, and K. von Schuckmann, 2011: Earth’s energy imbalance and implications. Atmos. Chem. Phys., 11, 13421-13449, doi:10.5194/acp-11-13421-2011. Also, Dan Lubin in a 2010 talk on video reported the 50-year simulation model with solar forcing matching Maunder Minimum got -0.35 degrees to GMST and the proxy for actual was -0.3 degrees so climate model got slightly more Solar Grand Minimum than the actual without any GCR cloud effects (I assume because they aren’t accepted science (incidental: the climate model happened to show some Baltic sea icing, which actually happened. Also a spot east of Siberia iced). So, it appears the present status is that the theory of Svensmark hasn’t been shown as producing the goods, so still interesting to pursue more but right now it’s an odd case of “skeptics” greatly, strongly, preferring theory that’s untested in practice to actual data so far, an odd situation for “skeptics”.